I was enjoying a cup of tea with naturalist Alex Scott at Ullapool recently (November 2018), in the course of which he showed me a copy of the Grampian Speleological Club Bulletin he had just received. 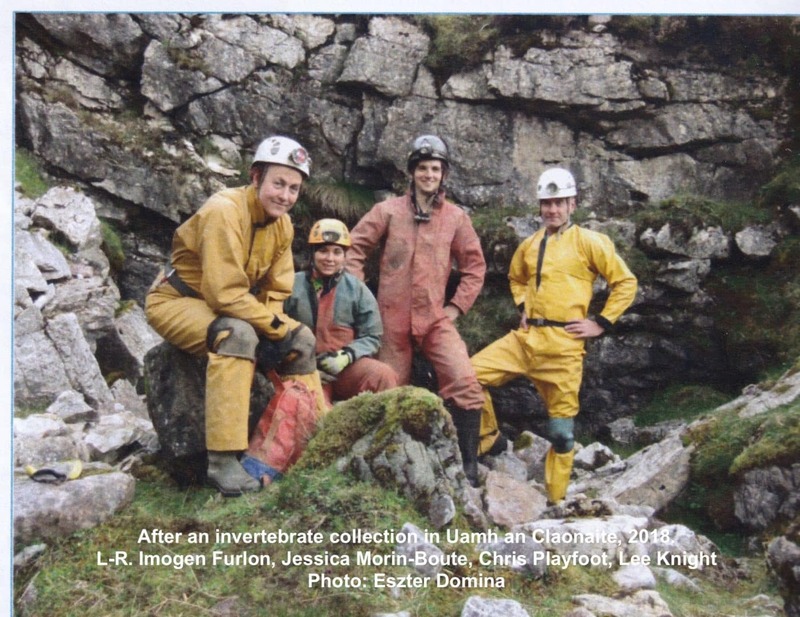 It contains an interesting article on The Aquatic Invertebrate Fauna of Selected Scottish Caves (Knight, 2018), including six sites in Assynt. Alan Jeffery, Editor of the Bulletin, sent me a copy, and the author, Lee Knight, has kindly agreed to the article being reproduced in full on our website. There are earlier records of Sutherland cave faunas (Ford, 1959), which I have yet to access, but this is the first systematic study of the subject across Scotland. It is based on extensive fieldwork undertaken by Lee from April 2015 to April 2017, with the help of a team of cavers, backed by specialists on some of the invertebrates collected. Caving is a well developed discipline using lots of technical terms. It took me a little time to get my head around these, but they are useful shorthand. In this particular context many relate to the mythical river of the Greek underworld, the Styx. Arranged in descending order of their fidelity to such habitats, they are: stygobiontic (life forms limited to subterranean aquatic habitats), eustygophilic (occurring in surface waters, but capable of forming breeding populations underground) and, finally, stygoxenes (accidentally washed into caves). Of the Assynt caves visited, one was in the Traligill valley (Cnoc nan Uamh) and four in the valley of the Bone Caves and adjacent areas (Rana Hole, Uamh an Claonaite, Allt na Uamh Stream Cave and Otter Hole); the resurgence at Fuaran Allt nan Uamh was also sampled. The stygobiontic and eustygophilic invertebrates recorded from these six sites were not all nameable to species, but those that were covered a range of groups: Tricladida (flatworms, 2 spp. ); Oligochaeta (segmented worms, only 1 sp., but many un-named); Cladocera (water fleas, 2 spp. ); Copepoda (water fleas, a dominant group in freshwater habitats, 4 spp., including Bryocamptus zschokkei); Ostracoda (seed shrimps, 9 spp., including possible examples of the very rare Fabaeformascandona latens); Halacaridae (water-mites of a predominantly marine family, 2 spp.). In addition.a number of groups of stygoxenes were recorded, adding to our knowledge of their distribution in Assynt. They included 6 species of stoneflies, seven of mayflies, four of caddisflies, the alder fly Sialis lutaria and two waterbeetles. Some 43 species recorded from the Assynt caves are listed in Table 1. Taken with those recorded from caves in five other areas of Scotland (including Smoo Cave at Durness), this article is the product of an impressive programme of research by the author and his helpers, which makes fascinating reading. Just in passing, there is also a reference, formerly unknown to me, to the zonation of plants in our best-known local pot-hole, Uamh an Tartair near Elphin, (Dowswell, 1976); I shall try to obtain a copy. Dowswell, P.N.F. (1976). An investigation of the hydrology and biospeleology of the Elphin District, Sutherland. Napier College thesis. Ford, T.D. (1959). The Sutherland Caves. Trans. Cave Research Group of GB 5:2.